Sometimes the numbers, no matter how polarizing, are not a clear indication of any given game’s result. The 55th annual rivalry football game between two familiar crosstown squads is a prime example of this. 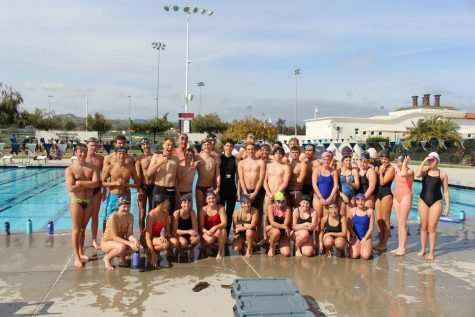 On Friday, Oct. 12, the Buena High School Bulldogs played host to Ventura High School. The Cougars, entering the game with a miserable record (0-7), needed to disregard the numbers that had defined their season thus far and zone in on the “biggest game of the year for us,” according to defensive coordinator Patrick Duffy. 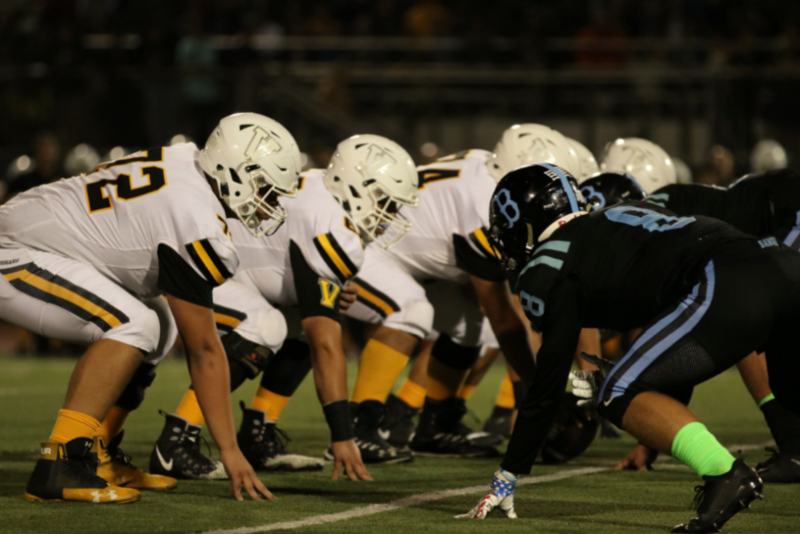 In a game that was decided in the final minutes, Ventura edged Buena by a final score of 20-17, winning their first game of the 2018 season while also clinching a victory against the Bulldogs for the ninth straight year. Having won the coin toss, Ventura elected to receive and started their evening with the ball near midfield after a solid return. Cougars quarterback Carson Willis ‘20 engineered a methodical drive consisting of play-action passes, screen passes and some rushes that were dispersed over the course of the first six minutes of the contest. 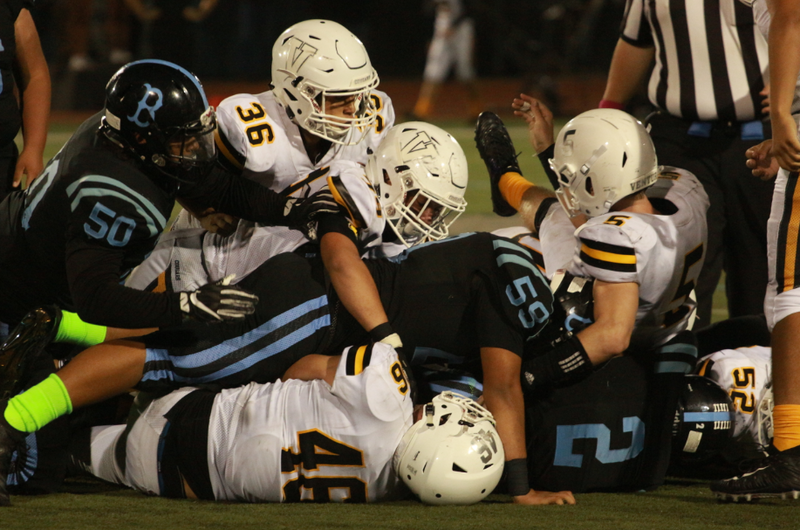 Finding themselves in the red zone, Ventura couldn’t capitalize as Willis couldn’t handle the snap, leading to a sack and a loss of nine yards. Kicker Rourke Rieman ‘20 then salvaged the drive with a field goal that gave the Cougars an early 3-0 lead. Buena’s first opportunity on offense, highlighted by a fake punt to convert on a fourth down, looked promising until they eventually faced a longer fourth down. The Bulldogs were forced to punt it away and the first quarter came to a close shortly after. Ventura’s Carson Willis gets sacked on the 20, forcing the Cougars to go for a field goal. They now lead 3-0. Buena’s defense held strong to open the following quarter. 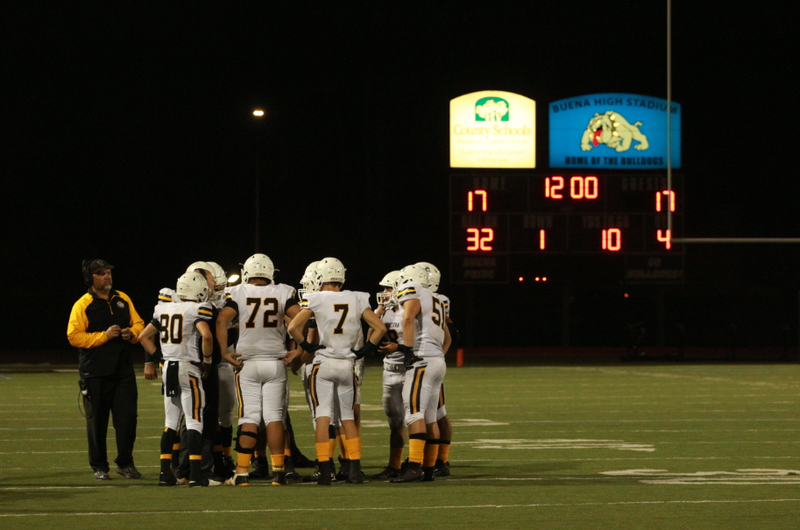 Once the Bulldog offense regained possession, they took advantage of Ventura’s shaky run defense. Robert Aguilar ‘19 put Buena inside the 20-yard line with two big rushes, both of which resulted in a first down. The drive was capped by a six-yard rushing touchdown from Bulldogs running back Devin Morris ‘19 and the point-after attempt was converted. 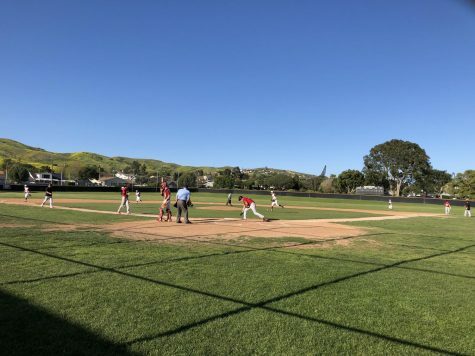 The Cougars answered right back with their running game, featuring Noah Conboy ‘19 who got Ventura deep into Buena’s territory late in the first half. From there, Willis found Jaden Cline ‘20 in the end zone on a 22-yard touchdown strike, as the Cougars pulled ahead 10-7. However, the half would end with the two teams knotted at ten apiece thanks to a field goal from Taylin Butterbaugh ‘21 in the waning seconds. 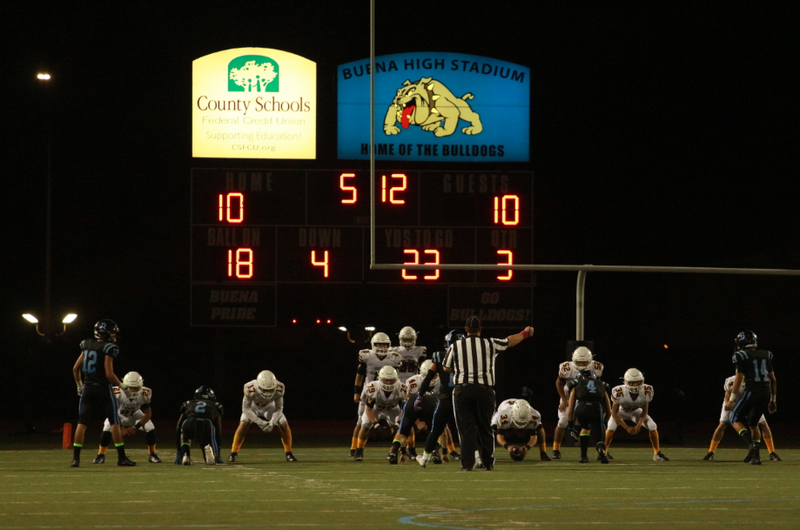 Buena turns it over on the kickoff, causing Ventura to start the half on Buena’s own 38 yard line. 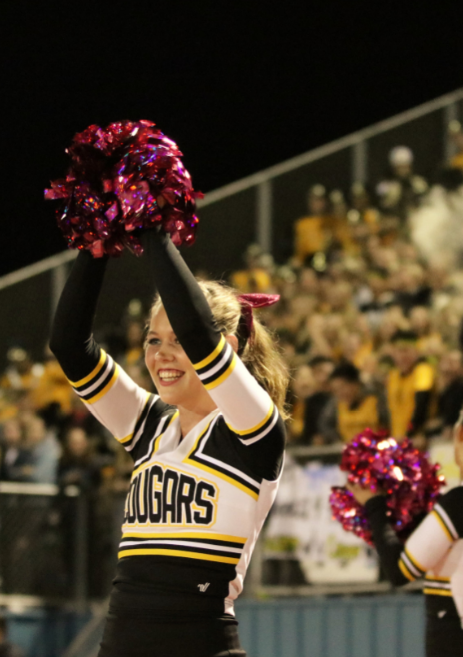 The third quarter opened with a jolt as the Cougars were able to recover a Bulldogs fumble on the second-half kickoff, putting them in prime position to tack on more points. Unexpectedly, Ventura came away empty on the drive and proceeded to trade possessions with Buena over the next 11 minutes. With 49 seconds left to play in the quarter, it was the Cougars who finally broke the longstanding tie. Zack Rodriguez ‘20 caught a 25-yard pass from Willis for the first six points, which, paired with Reiman’s successful PAT, gave Ventura a 17-10 lead. That wouldn’t be the end of the third, however. With only 34 seconds left, Buena received the kickoff and ran it to the Cougars’ two-yard line, setting up Mathis to finish the job with a short rushing touchdown. 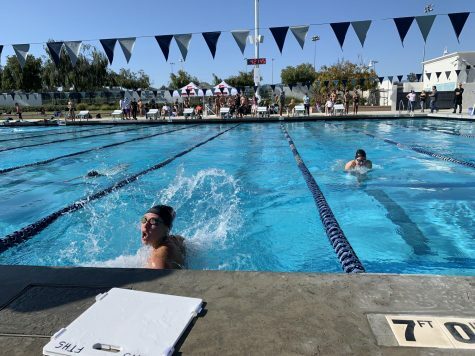 Buena and Ventura both threw interceptions in the initial part of the final quarter, but the Cougars began to distance themselves with five minutes left to play. 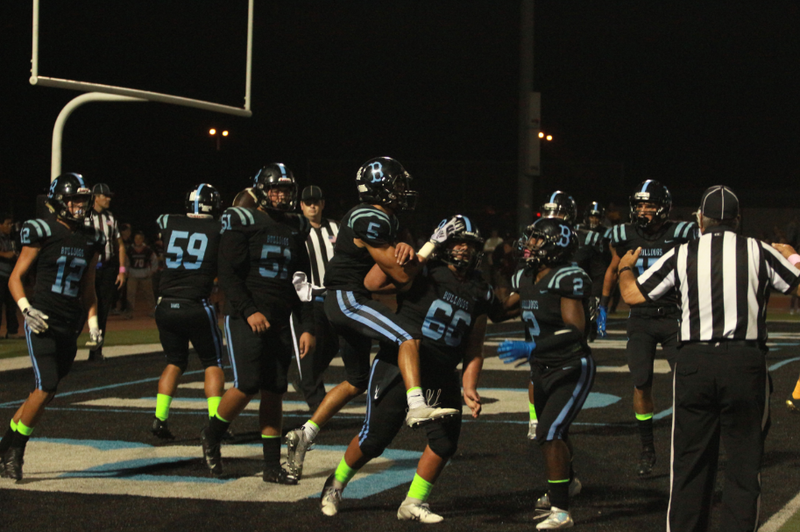 A blocked punt led to a go-ahead field goal from Rieman, which would prove to be the game-winner after Ventura’s defense stood solid in a last-gasp attempt from the Bulldogs’ offense. As time expired, the ecstatic Cougars’ sideline spilled onto the field to celebrate a 20-17 victory. Ventura opts to kick a field goal on fourth and one. With the goal, they lead 20-17 with 3:45 remaining. 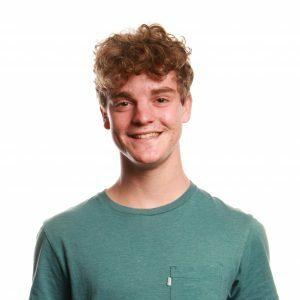 Before drilling the clutch field goal to give his team the win, Rieman described himself as “pretty nervous before I went out” onto the field, but also conveyed his ability to thrive under pressure. 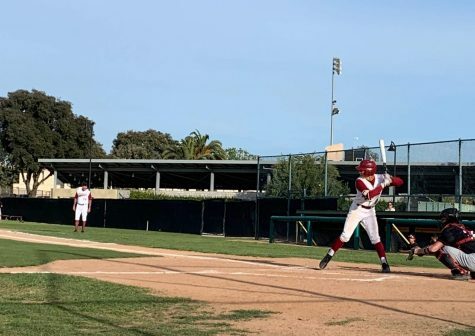 “Once I was out there, it just got natural like practice and it went through the uprights,” he said. 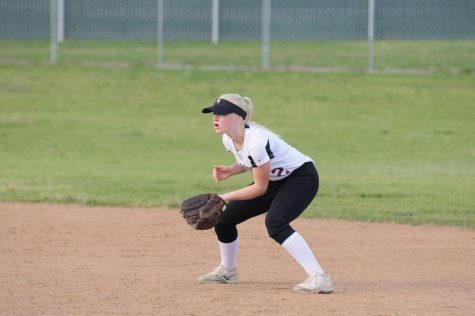 The Bulldogs will have a chance to break their streak of nine consecutive losses against the Cougars in October of 2019. 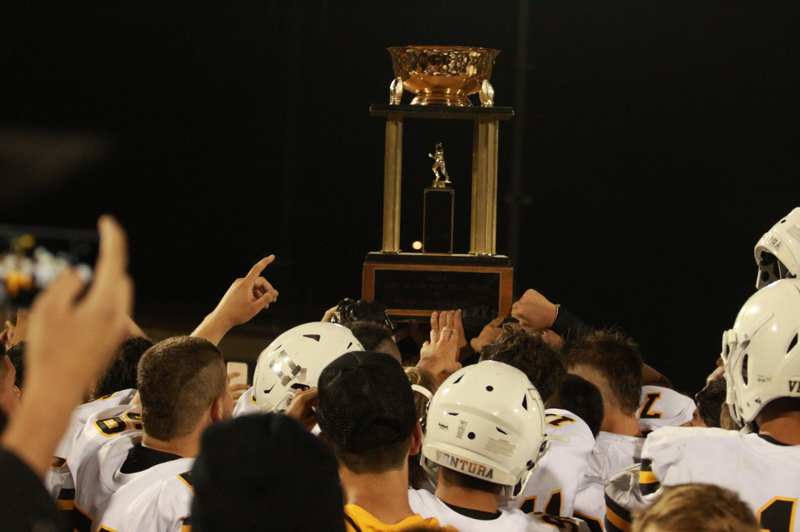 The game will be hosted by Ventura High School at Larrabee Stadium. 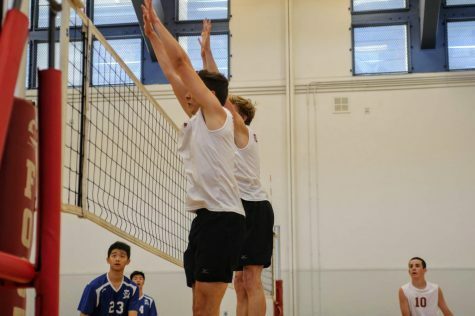 When discussing the graduating class of 2019, Duffy constantly reiterated that “it’s always amazing” to send the seniors off with a win in the rivalry game. 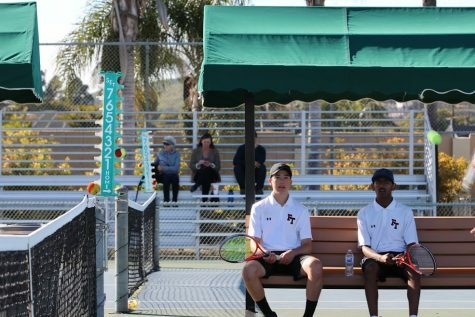 “I love our seniors […]. Those kids have worked their butts off and its important to me to know that they won all four years, so I love it. I just got so happy for them,” he said.